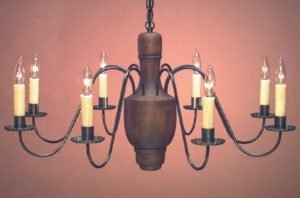 First of all, each Hammerworks Early American Reproduction Wooden Chandelier is custom handcrafted to your personal specifications. Most importantly, for these Colonial Wooden Chandeliers we hand turn each solid hardwood body. In addition, we hand form the antique tin or brass arms. 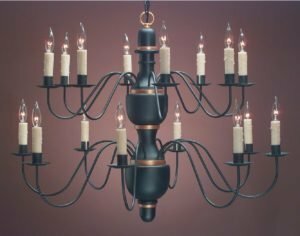 Especially relevant, we equip each Early American Reproduction Wooden Chandelier arm with a candelabra socket rated for up to 60 watts. Furthermore, we supply a matching ceiling canopy and 2 feet of chain with every Colonial wood chandelier. Of course, if you have a high ceiling and need more chain, you can order extra at a minimal cost. Most noteworthy, in terms of finish choices we offer several options. Choose from our selection of Old Village paint or stained hardwood colors. Of course if you prefer, we will gladly use any paint or stain color you wish to supply to us on your own. No matter what, the end results are truly one of a kind custom Country Wooden Chandeliers. Certainly we offer a great selection of Colonial Tin Chandeliers to complement your Colonial Home Wooden Chandelier. Consequently, you can use a Primitive Antique Tin Chandelier in your great room to contrast the Dining Room Wooden Chandelier. Of course, we also create Antique Home Chandeliers by hand. Furthermore, you can choose from either antique tin or brass finish options. Likewise, wattage and chain options for these vintage chandeliers are the same as those mentioned above. Similarly, our Colonial Wall Sconces are made to coordinate with your rustic chandelier. So you can shop for Classic Design Tin Wall Sconces with confidence, knowing that they will match perfectly with your country wooden chandelier. Even more important, you can choose from the finish options of either the Vintage Brass Wall Sconce or the Reproduction Tin Wall Sconce.